The problem considered is illustrated in the photo of a laboratory test shown on the left. Of course, airbags are standard in motor cars but their optimum use is still being investigated. The uniqueness of the analysis described here is that the shell model fully coupled with the Navier-Stokes fluid model is solved using the implicit time integration algorithm in ADINA. This ensures that at each discrete time step considered, iterations are performed to satisfy the fully coupled mass and momentum equations for the solid and the fluid regions at that time. While there is clearly much benefit in having airbags during an accident, there is also concern of a risk of injury from a deploying airbag. This risk applies predominantly to passengers which are located within the deployment region of the airbag. This so-called "out of position" problem involves a very complex interaction between the airbag, vehicle environment and occupant. 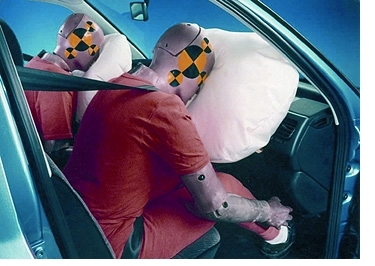 Experiments have shown that the simulation of the airbag behavior, and resulting loads on the passenger, assuming a constant airbag pressure, i.e., without taking the full fluid-structure interaction into account, is not sufficiently accurate to produce useful results. Therefore, several attempts have been made in recent years, in various research and industrial environments, to simulate the complex response in the out-of-position situation using explicit solvers. However, explicit time integration solutions are not able to describe the stress distribution accurately and can even lead to shapes significantly different from experimental data. As a result, the out-of-position simulation of airbags is still not standard in industrial airbag developments. The reliable use of implicit time integration is needed. The movies show results obtained by ISKO Engineers AG, München, Germany, using ADINA in an implicit time integration solution. ISKO performed the simulation as a fully coupled fluid-structure interaction analysis, with automatic remeshing, including contact. The run was performed without any fine-tuning, and without any restart, using about 10 hours on an AMD Opteron 4-processor workstation. The time to set up the model with the ADINA GUI was approximately 30 minutes. This solution shows that simulation based on implicit time integration can now be used in industrial environments to obtain insight into airbag deployment problems — and this will result in new remarkable possibilities for improved airbag designs.